The ideal racing goggles when every split second counts, the Sniper II offers refined functions and superior design. Change your fit quickly and easily with the VIEW's interchangeable nose pieces. 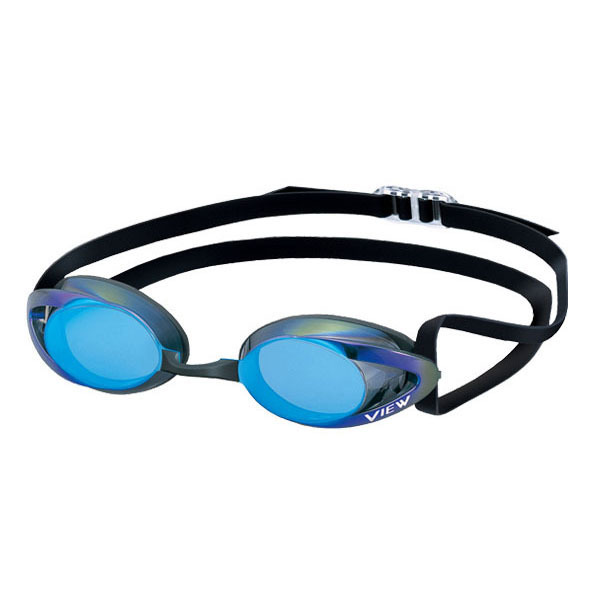 The small but comfortable eye seals allow the goggle to sit right in the eye socket decreasing water resistance and drag. The Sniper II goggle comes with 3 adjustable nose bridges for a better fit preventing lens warping, making it easier to don the goggle. This gives the ideal fit for any face. The simple but high-quality split head strap allows for a quick and easy adjustment. VIEW's Super Anti-Fog treatment provides long-lasting protection against fogging caused by perspiration and heat. Wetting the inside of the lenses before use creates a film of water that ensures a clear field of view and allows the treatment to work effectively. VIEW's hypo-allergenic T.P.E. seals provide maximum comfort and water-tightness over extended periods of use. The T.P.E. seals are not sensitive to the skin and are able to be manufactured in numerous color combinations, unlike surgical grade silicone. VIEW's UV Cut technology provides superior protection from harmful ultraviolet (U.V.) rays. Increasing exposure to U.V. rays which damage the skin and eyes has become a serious problem. U.V. protection provides greater eye protection during outdoor use. Learn more about FINA HERE. Some colors may not be available in all markets, please contact your VIEW retailer or distributor.